I drove up to Vallejo for my nephews High School graduation. Then I took my Subaru on a long shake-down cruise to Portland and Seattle. 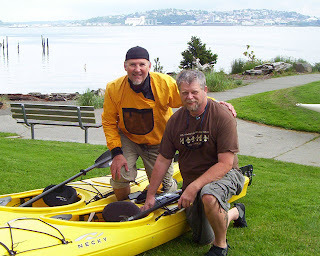 Visited my dive buddy, Scott, in Portland. Then up to Seattle too revisit all my old Coast Guard haunts. 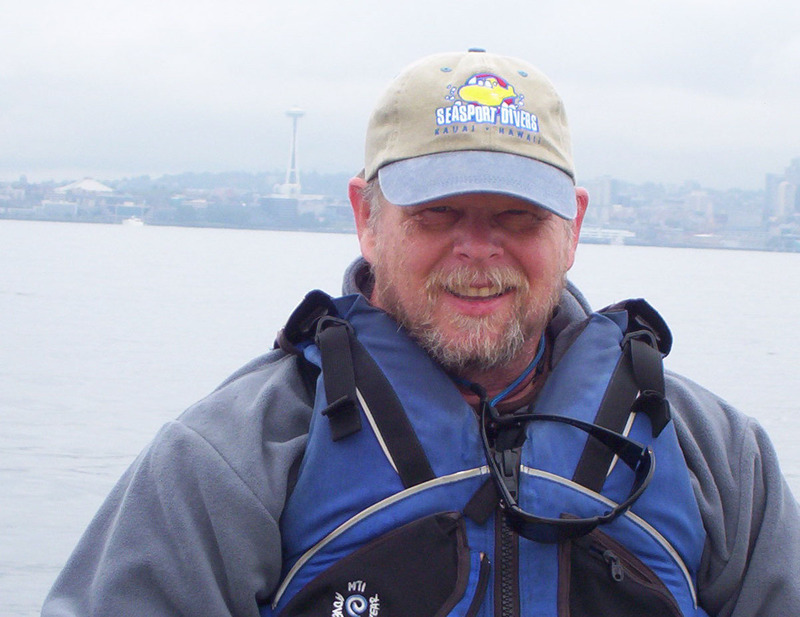 Went to Alki beach and took a tour of Eliot Bay and the Coast Guard Lighthouse on a Necky sit-in kayak. While waiting for my tour I met with three divers getting ready to dive the in Eliot Bay. They were all in dry suits. But after a brief discussion with them I determined it would not be too uncomfortable to dive in a wetsuit. The temperature of the water was about 50. I have dived in waters of that temp in San Diego and in the New Zealand winter on the South Island. I was told that you can encounter the Giant Octopus right in Eliot Bay. This is my guide, Scott, from Alki Kayak Tours at Alki Beach. My yellow Necky kayak. In the background is Queen Anne Hill just to the North of Downtown Seattle. Only my second time in a kayak with a rudder. I picked it up quickly. Me with the Space Needle rising above the city. From the launch we went west past Alki (originally maned New York by the Settlers) then changed to its Indian name. There is actually a small replica of the Statue of Liberty near the shore. 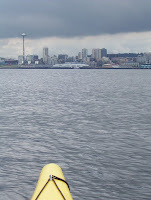 The bow of my kayak points toward the Seattle skyline and some ominous clouds. As the day went on it would lighten some and the sun break through. I actually had to take off my jacket a little later. Our goal and turn-around point the Coast Guard Lighthouse at Alki Point.